In 2006, informative and entertaining hummingbird banding presentations are scheduled for North Carolina & Kentucky/Tennessee. If your group would like to host "Hummingbird Mornings" anywhere in the U.S. or Canada in 2006 or later, see below and contact Bill Hilton Jr.
As the "dog days" of August approach, activity at Hilton Pond Center seems to slow down a bit--almost as an acknowledgement that things are getting progressively hotter. All the spring and early summer wildflowers have finished blooming; in fact, many have set seed, wilted, and disappeared with the onset of seasonal heat. Late summer blooms such as Goldenrod haven't yet appeared, so about the only blossoms around are Winged Sumac and Daisy Fleabane. With a little work, however, we can still find natural wonders around Hilton Pond, beginning at our very backdoor--where a robotic-looking Leaf-footed Bug is the first ingredient in our Mid-Summer Potpourri. 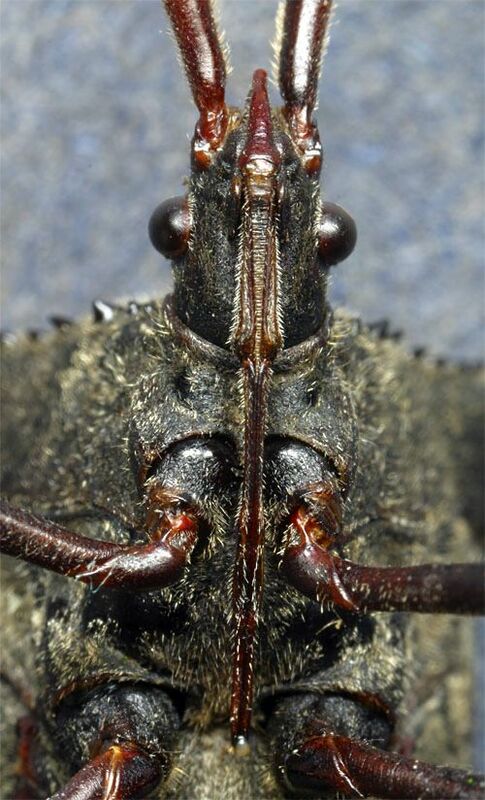 But scroll down cautiously; the view of the bug we present herein probably isn't what you might expect, and it's an image that might scare small children! There are many types of Leaf-footed Bugs, and all are TRUE bugs--Hemipterans--with long stylus-like mouthparts used to penetrate plant tissue or, in some cases, the exoskeletons of other insects. The particular bug in question was dead on our doorstep one day this week, cause of death unknown. That it was inanimate did provide us with an opportunity to examine it very closely without fear of being stabbed by its proboscis, so we rolled it over on its back and brought out our extreme macro lens for a close-up of mouthparts that reached from the tip of its head all the way to between its second pair of walking legs. The mouthparts measured three-eights of an inch in length--pretty impressive for an insect whose total length was only an inch and an eighth. It was just the sort of image that might show up in a horror movie at midnight. 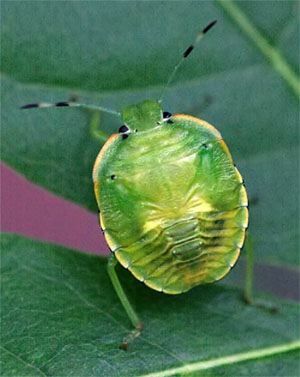 Just off the back deck of our old farmhouse we found another less-intimidating bug--a live one posed motionlessly on the leaf of a Fringe Tree. This much-smaller creature--slightly less than a half-inch in length--was an immature form of a Green Stink Bug (above right). On its back appeared to be some sort of animal face, but it was actually segments of its abdomen and the portion of an exoskeleton that would soon burst open to reveal two pairs of wings. The top pair would be membranous for only their latter half, with the front portion being leathery--hence the name "hemipteran," or "half-wing." Our little green bug was in its final instar, the last growth stage before it would emerge as fully winged adult. Later on, while we were examining the flowers on one of those Winged Sumac shrubs mentioned earlier, we noticed a leaflet with an unusual pattern. 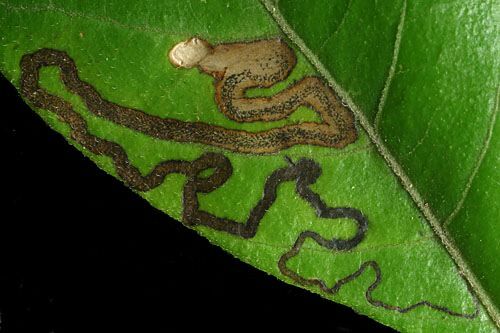 We recognized it as the trail of some sort of leaf-miner, one of many kinds of tiny insects--usually flies--that lay even tinier eggs in the mesophyll layer between the upper and lower epidermis of a leaf. In our photomicrograph of the leaf's top surface you can see a miniscule wound at lower right where the female insect penetrated the upper epidermis with her ovipositor and left behind an egg. The egg hatched, producing a very small grub that slowly but surely began munching its way through the highly nutritious interior cells of the leaf. The larva meandered along, its tunnel turning one way and then the other and getting progressively wider as it went--making what looks a lot like an ever-widening river complete with an oxbows and delta. Eventually, the maggot formed a pupa at the end of the tunnel and metamorphosed into an adult fly that made its way out--making a relatively large wound, since healed. Fortunately for the Winged Sumac, only one of its hundreds of leaves was infested by the leaf miner, and fortunately for the leaflet itself the larva didn't eat away all of the leaflet's internal cells. As we finished photographing the trail of the leaf miner we sensed something flying overhead and looked up to see a large white bird sailing toward the far end of Hilton Pond (above). 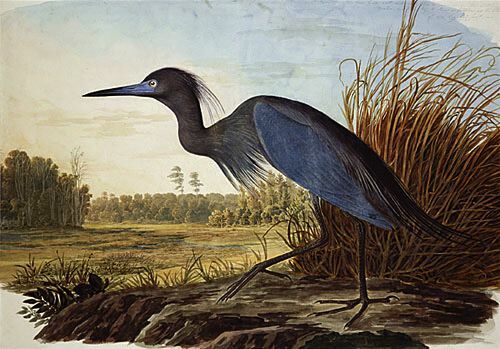 As it settled down it became obvious it was a wading bird, but not until we replaced our macro attachment with a 100-400mm zoom lens and peered through could we say for sure an immature Little Blue Heron had just landed. We fired off a couple of quick exposures and walked slowly toward the pond's near bank, but even that small amount of movement spooked the bird, which flapped to get airborne and disappeared over the trees toward a larger pond to the west. 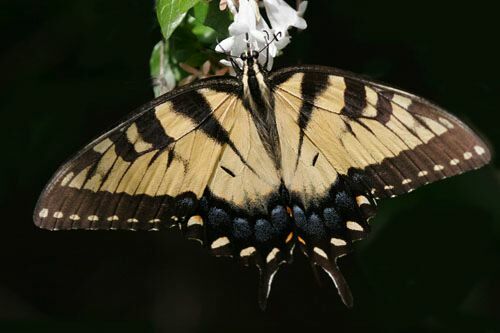 Our last photographic subject of the week was an Eastern Tiger Swallowtail butterfly (above), nectaring in full sun on an old non-native Chinese Abelia shrub growing along the road in front of Hilton Pond Center. Based on the preponderance of metallic blue on the butterfly's hind wing, we'd say the specimen was a female; males have much more black in that region. 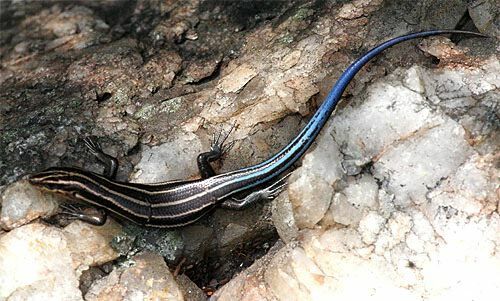 The species is unusual in that females occur in two color morphs, one like that in the photo above and the other all black. 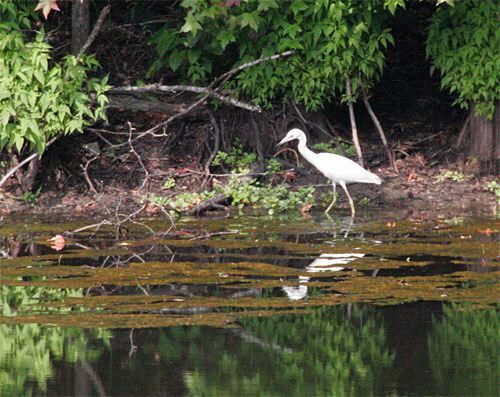 It may be hot as blazes the last week in July around Hilton Pond, but that certainly didn't mean nature was taking a siesta. As shown above, we had no difficulty finding a slew of things to photograph; there were PLENTY of ingredients for our Summer Potpourri. Our only problem was humidity so high that each time we took our camera outside from the air conditioned office we had to wait several minutes for lenses to unfog, and by then WE had started to sweat. Such is the life of the naturalist during summer in the Carolina Piedmont. Once again this year we'll be taking our Hummingbird Mornings programming to the Woodlands Nature Station HummerFest at Land Between the Lakes in western Kentucky. If you're within driving distance we invite you to come out for a public lecture Friday night (4 August 2006) and two days of hummer banding activities (Saturday & Sunday)--with exciting opportunities for you to get up close and personal with a hummingbird. (Did we mention the Nature Station is a traditional stop for early migrant Ruby-throated Hummingbirds? If you've never seen 200 ruby-throats simultaneously buzzing around feeders, here's your big chance!) Details and directions are at Hummingbird Mornings, or call the LBL office at (270) 924-2020. --The Carolina Piedmont is suffering from midsummer drought; fortunately it's not as bad as what we experienced in the late 1990s when the level of Hilton Pond dropped more than four feet, but the water is down about 14 inches or so. Needless to say, we welcomed the 2.3" of precipitation that came on the night of 22-23 Jul, when the skies opened up for a couple of hours of almost non-stop lightning and thunder. --We just got word the orphan Great Horned Owl nestling rescued by one of our students in Rock Hill SC back in March and rehabilitated by Carolina Raptor Center was released fully grown on 1 May in the Cornelius NC area. Based on relatively small size--971g--the bird likely was a male, since female GHOWs are larger. Prior to release he was catching live prey and exercising in a 40-foot flight cage; CRC banded him with size 8 band #0788-50919. We chalk this up as a success story for the owl, CRC, and the Self twins who found and brought the bird to Hilton Pond Center.